Perhaps we were a tad hasty when we chastised the Los Angeles Times for letting a trojan run their Bruin blog. We thought that there was NO WAY that someone from sc, no matter how UNBIASED and Professional they claim to be, would ever allow “The Trojan-Haters Club” to get recognized. Apparently, we were dead wrong. It seems that Adam Rose is holding to his word that he would give the Bruin blog all the time and effort that it requires to keep it a viable source of inside information for Bruin fans. Contrary to the expectations that abounded when Rose was told that he had to add the UCLA Beat to his usc Beat, he did NOT combine them. Bruin fans do NOT have to filter through news about Mitch Mustain and Mark Sanchez to find out about Pat Cowan and Ben Olson. The “What’s Bruin” blog is still just a UCLA site, and unlike with Lonnie White, there is no subtle undercurrent of negativity or sarcasm. Rose’s only “agenda” is to be Professional, and to deliver a top-quality blog that Bruin fans want to read. In fact, Rose was honest enough to “admit” recently that the UCLA Dance Team was the #1 Squad in the entire Pac-10. He gave #2 Oregon the nod for pure photogenics, but gave UCLA the Title, after inserting talent, wardrobe, and attitude into the equation. NO real Bruin-Hating trojan would EVER make an “arbitrary” decision like this — and make it public — knowing that his trojan brethern are going to read it, and skewer him for it. But the ultimate proof of the lack of an evil agenda is supposed to come today. Mr. Rose has informed us that today he will be linking our UCLA Spirit Squad Audition Photos, from LATimes.com. That will be a first for us — To be linked by the City mainstay, AND, to be helped by a trojan. Of course, maybe we are over-estimating the Times’ popularity in cyberspace. Mr. Rose is acting so graciously — having asked permission to use the photos and to link us, and then thanking us for consenting — that it’s almost as if we are the ones doing HIM the favor. We don’t see it that way. We are always happy for our (BeatSC.com-labelled) photos to get extra exposure (for US and for the Program), and we are still thinking that the Times web-traffic numbers are exponentially higher than those of an independent blog. So, we’ll see. But the important thing is that Mr. Rose seems to be one of those very rare “Cool” trojans, who happens to have a great “vision” for the future of his Bruin Blog, and we will be supporting him whole-heartedly from now on. Because we expect some new visitors today and in the near future, we went back through the archives of the past four months, and pulled 19 more never-before-seen photos of the students of the UCLA Spirit Squad, mingling on campus prior to Bruin Basketball games. If you click on the photos, they will enlarge quite a bit, and if you just “mouse over” the pics, a pop-up caption will make you roll your eyes over a corny “Rose” pun, or something equally irreverent. "ROSE CHARADE, OR ROSE-BUD?" 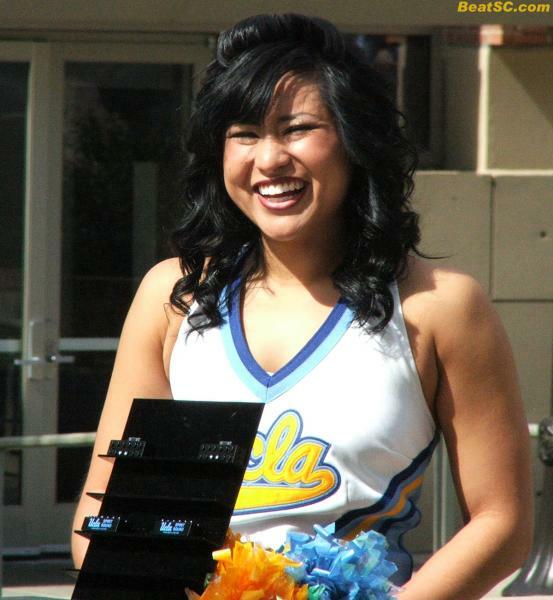 was published on April 24th, 2008 and is listed in UCLA/usc/Cheerleader Photos. we can’t get over BRIANNA or 129!!!!!!!!!!!!! good for you t-h! i’m glad to see this site get more recognition. #4 is my favorite. It’s great to be a Bruin… and a man. Yes, Katie’s lips do look like rose petals, there’s NO ONE like Katie. I read them all the time, after all you do for us readers, it’s the least we could do – specially knowing you always got something to say. In the past I downloaded the pictures to post them on my myspace page, and now I can’t download the images anymore, did you change something in your system to keep us from downloading them? Thanks and I will wait for your response. Thanks t-h, problem solved, you’re the best.